For my blog with posting on household energy issues see my website Energy for Development. Douglas F. Barnes, Kerry Krutilla and William F. Hyde. 2005. 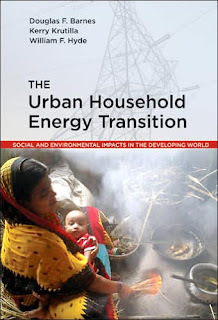 The Urban Household Energy Transition: Social and Environmental Impacts in the Developing World. RFF Press, Washington, D.C.: Routledge. As cities in developing countries grow and become more prosperous, energy use shifts from fuelwood to fuels like charcoal, kerosene, and coal, and, ultimately, to fuels such as liquid petroleum gas, and electricity. Energy use is not usually considered as a social issue. Yet, as this book demonstrates, the movement away from traditional fuels has a strong socio-economic dimension, as poor people are the last to attain the benefits of using modern energy. The result is that health risks from the continued use of wood fuel fall most heavily on the poor, and indoor pollution from wood stoves has its greatest effect on women and children who cook and spend much more of their time indoors. In The Urban Household Energy Transition Barnes, Krutilla, and Hyde provide the first worldwide assessment of the energy transition as it occurs in urban households, drawing upon data collected by the World Bank Energy Sector Management Assistance Programme (ESMAP). From 1984-2000, the program conducted over 25,000 household energy interviews in 45 cities spanning 12 countries and 3 continents. Additionally, GIS mapping software was used to compile a biomass database of vegetation patterns surrounding 34 cities. Using this rich set of geographic, biological, and socioeconomic data, the authors describe problems and policy options associated with each stage in the energy transition. The authors show how the poorest are most vulnerable to changes in energy markets and demonstrate how the collection of biomass fuel contributes to deforestation. Their book serves as an important contribution to development studies, and as a guide for policymakers hoping to encourage sustainable energy markets and an improved quality of life for growing urban populations. Douglas F. Barnes, Priti Kumar and Keith Openshaw. 2012. 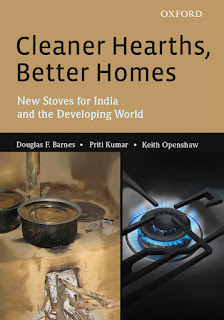 Cleaner Hearths, Better Homes: New Stoves for India and the Developing World. New Delhi: Oxford University Press. In a largely globalized world, characterized by immense technological advancements in many sectors, many developing countries depend on biomass energy for sustenance even today. Much of the Government of India's projects related to the improved stove program have been branded a "failure". However, they appear to have promising features. 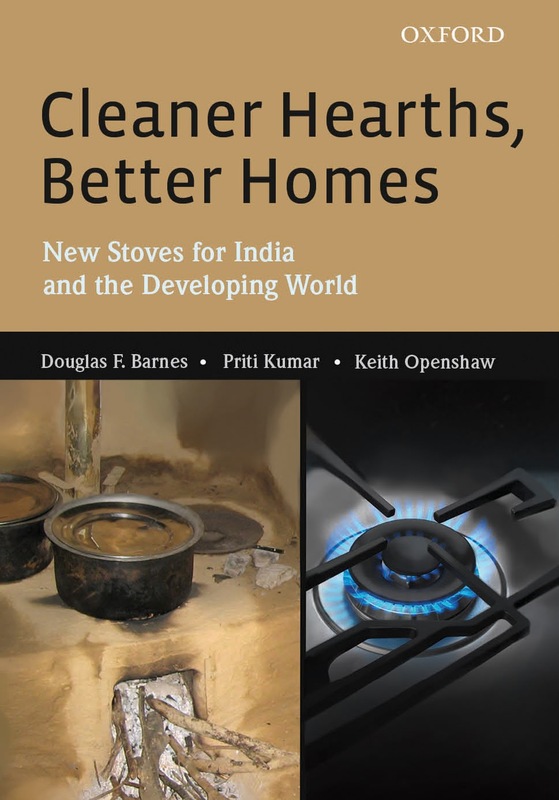 Cleaner Hearths, Better Homes draws on case studies from the Indian states of Maharashtra, Haryana, Karnataka, Gujarat, Andhra Pradesh, and West Bengal, and other stove programs around the globe. The book describes India's best improved biomass stove programs, and recommends ways in which the international community can promote the use of more affordable stoves as against the traditional cookstoves. These new stoves are energy efficient as well as easy to use, thereby leading to a significant reduction in indoor air pollution and health risks. The findings of the Indian government's stove programs are translated into a set of recommendations in this book that could prove beneficial for half the world's population that depends on biomass energy for their livelihoods. World Bank. 1996. 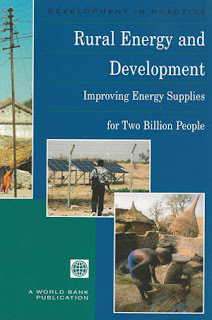 Rural Energy and Development : Improving Energy Supplies for Two Billion People. Development in practice. Washington, D.C.: The World Bank. For nearly two billion people in developing countries the search for energy is a daily grind. These people have neither electricity nor gas nor oil to cook their food. Women and children from these families often spend hours each day gathering dung and wood-hours they might otherwise be able to spend on productive work or education. Their health is damaged by the smoke given off by these fuels. Their environment may be damaged as they chop down trees for wood. The problems of rural energy have long been recognized. In the 1990s I led the efforts to develop a strategy for rural energy for the World Bank which has had a significant influence on the World Bank’s energy program, and it was published as Rural Energy and Development: Improving Energy Supplies for Two Billion People. This is the publication that first launched the World Bank on considering renewable and decentralized energy as important areas for financing. The context is that in the 1990s the Bank's work in energy was largely focused on making existing energy supply and consuming industries more efficient, opening them up to competition. and encouraging private sector participation. This was an important job and is far from finished. But this book was the first to argue that the World Bank should not concentrate on reforming existing energy markets alone. Any reform will fail in the long run if it does not benefit the whole population. Improving rural energy therefore was seen as an important goal in itself. The exciting message of this book was that, through a combination of better technology and decades of experience the World Bank could tackle the problems of rural energy better than ever before. Kulsum Ahmed, Yewande Awe, Douglas F. Barnes, Maureen Cropper and Masami Kojima. 2005. Environmental Health and Traditional Fuel Use in Guatemala. Directions in Development Series, Washington, D.C.: World Bank. Recognition of the problem of indoor air pollution and its deleterious effects of health is growing worldwide as efforts increase to understand and articulate the complex health-air pollution linkages. Exposure to indoor air pollution can be attributed to two principal sources. Historically, the most important sources have been cooking and household heating using solid fuels such as firewood, coal, manure, and agricultural waste. More recently, environmental tobacco smoke has also been identified as a major source of exposure in industrial countries. Recent WHO estimates indicate that indoor smoke for solid fuels causes 4 million deaths annually and accounts for a significant percent of the global burden of disease. In Guatemala, adverse health impacts of IAP disproportionately affect children in poor, rural households of which 97 percent use fuelwood as the dominant cooking fuel. Based on data from two recent household surveys and the results of worldwide IAP health studies, Environmental Health and Traditional Use in Guatemala examines the relationship between fuel use and health in Guatemala. The main purpose of the book is to draw attention to a major problem by highlighting the effects of IAP on the health of children in rural households in Guatemala and to identify appropriate options to mitigate those effects. A free PDF is available is available for download from the World Bank.